Elliebelly Knit & Dye Works > Blog > Dyeing > Dyeing Yarn with Natural Dyes. Part One. Dyeing Yarn with Natural Dyes. Part One. You will never guess. What natural dyestuff do you think I dyed these yarns with? It's definitely not an obvious choice, unless you've done this before, but all three of these skeins were dyed in a vat prepared from black beans. Here they are, soaking in the kitchen. I use a pot with a strainer so I don't have to fish all of the beans out after the "juice" is ready, and since this is nothing but black beans, I have none of the usual worries about working in the kitchen. I'll include tutorial notes on the steps I took, in case you want to dye along with me. I eye-balled the amount of water I would need to cover my skeins, and after rinsing the dust off of the beans, covered them in water, stirred them up, and left them to soak. This batch soaked for about two and one-half days. The day before I wanted to dye my yarn, I pulled it out to mordant. The mordanting process makes it possible for the dye molecules to stick to the yarn molecules, much as in commercial wool dyeing where citric acid is used in the process. There are a number of mordants available for use with natural dyes. Here, I'm using aluminum sulfate, which, although considered safe, means we're back to using designated dye pots and a mask for mixing. We're using skeins of three different yarn bases here, because natural dyeing produces fascinating and often unpredictable results on different fibers. On the left is a skein of Elliebelly Pixie Superwash Merino. The middle skein is Elliebelly Panda, a 50/50 silk bamboo mix. The final skein is undyed Malabrigo Mecha, which is a single-ply Merino, that is not superwash. Here they are in the mordanting bath, with 5 tablespoons of Alum and a tablespoon of kitchen grade Cream of Tartar, which acts as a mordant/brightener. I take close to an hour to bring the submerged yarn to a temperature where the yarn is not quite simmering. Then, lid on but off the stove, the pot sits until the yarn is completely cool before going into the dyepot. This is particularly important in this case, as dyeing with black beans is a cold process, and the colors gray out if heat is applied. Remember to use your stove fan if dyeing in the kitchen. 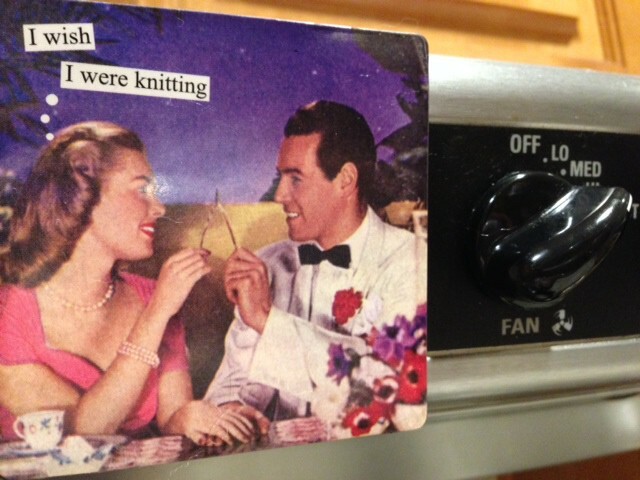 (With thanks to my husband for the lovely magnet that graces the hood of our stove). Tomorrow, we'll walk through the dye bath and admire the finished yarn in Part Two. ← Dyeing Yarn with Natural Dyes. Part Two. A good reminder of the importance of the mordant. Isnt that the truth? I did some fabric over the weekend as well. Do you want to play with it in some of your art? Id be happy to send you a fat quarter!